I saw these cookies in a magazine ad and thought they cute and easy to make. They definately were! These are from the Bettycrocker.com website. Heat oven to 375. In medium bowl, stir together cookie mix and cocoa. Add butter and egg: stir until soft dough forms. On floured surface, roll dough to 1/4 inch thickness. Cut with 5″ gingerbread man cutter. On ungreased cookie sheet, place 1 inch apart. Gather dough scraps: reroll until all dough is used. Bak 7-9 minutes or until cookies are just puffed and tops are dry. Cool 2 minutes; remove from cookie sheet to cooling rack. Cool completely. Spoon frosting into resealable plastic bag. cut 1/4 inch hole in 1 bottom corner. Gently squeeze bag to pipe frosting on cookies for bandages. Attach eyes. Store cookies in airtight container. NOTE: As you can see, since I had a hand cookie cutter, I also made skelton hands. 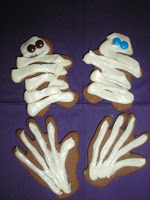 This recipe made 16 hands and 11 mummies! They will be fun to serve to friends and family tomorrow night after trick or treating!